So, I’ve spent the last week using Stanley’s reissue 750 socket chisels in sizes 1/8″, 1/4″, and 3/4″. I didn’t set up any arbitrary test criteria or elaborate measuring devices to determine who knows what. All I did is what I normally do with chisels during a workday in my cabinet shop. You know, pare chamfers, clean out glue glops, chop joints and open paint cans. I’m kidding about the paints cans. For that I use a pocketknife. Over the years I’ve decided I want 4 things in a new bench chisel. It has to be well machined from the factory – I can’t afford to spend the entire day tuning it up. 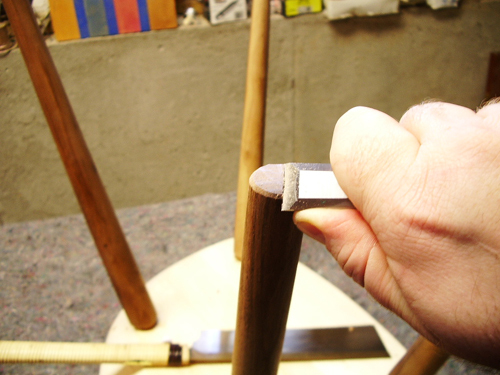 It must stay sharp for a reasonable amount of time – The edge can’t deform every time I hit it with a mallet. The handles have to be comfortable and not prone to splitting or breaking. I’d like the tool to look nice as well. 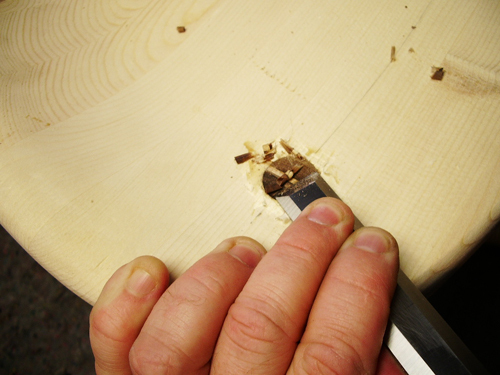 I think a little care in form and design adds to the innate pleasure of using a fine tool. As I mentioned above, I found these new 750s to be well machined out of the box. I got the backs flat quickly. You’d expect this from a premium tool. Were they as perfect in form as, say, the Lie-Nielsen’s? No, but the lower price of the Stanley’s adequately reflects this. After the initial sharpening, I only had to touch up each edge on either a strop charged with honing compound or my 8000 grit water stone during this evaluation. This seems right to me based on my experience with other premium chisels. They definitely held up better edgewise than any of the economy line chisels I own. Now all this is purely anecdotal on my part of course, but I feel I’ve gained a good grasp over the years on how long a chisel edge should last. As for the handles not splitting, only time will tell. Hornbeam is pretty tough stuff after all. In my opinion, nothing beats a socket chisel for looks and longevity. Socket chisels are definitely worth the extra money compared to say a tang fitted handle. Bottom line? I’m enjoying Stanley’s new 750s. I feel the price to quality ratio is certainly there. They are a great option if you’ve always wanted a set of socket chisels and either couldn’t find the originals or afford the ones on the used market. You’ll have to spend a little more time on these to get them pretty if that’s important to you, but you’ll save money. I, for one, look forward to rounding out my collection with some fill-in sizes soon. Here’s a parting tip a friend suggested. 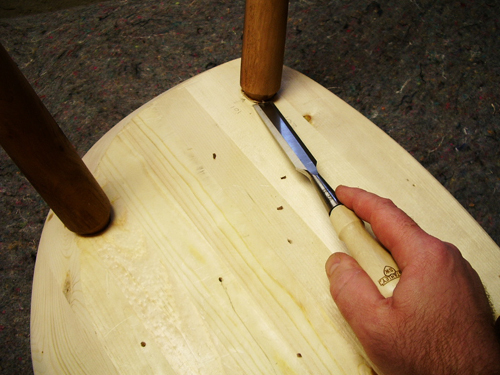 While the handles are off, why not make a pattern by tracing around one of the handles on a piece of scrap. Label the pattern and store it in case you ever need to turn a replacement. Chris Black makes cabinets, sharpens hand saws and sells old woodworking tools. Send him an email at redscabinet@gmail.com and follow him on twitter @chrislblack. Thanks for the review! I’m in the market for new chisels and the Stanley Sweethearts and the Lie Nielsens are both on my list. Are the sides of the Sweethearts ground as closely as the Lie Nielsens? How well did they perform cleaning out the waste from dovetails? The side bevels of Stanley’s are not side-ground/stoned as close as the LN’s. Even though I hand-cut all my dovetails, I typically don’t side grind my chisels. Although, I have in the past, and some woodworkers certainly prefer it. As far as cleaning out waste, they performed deftly. The Stanleys are well balanced, and easy to grip near the business end for paring or chopping.